Four 16-year-olds from our region in Israel, 2 from Kiryat Malachi and 2 from Hof Ashkelon, will travel to Seattle in mid-July to work at camps for 6 weeks. Yuval, from Kibbutz Zikim, is one of the youth from Hof Ashkelon. Kibbutz Zikim has been in the news a lot lately when qassam rockets have been shot north toward Ashkelon. I met Yuval and his parents at a gathering of counselors and told them that I was interested in seeing the kibbutz, so the Mom, Talia, invited us for lunch on Monday, July 7th. Kibbutz Zikim is situated a short distance north and west of Kibbutz Yad Mordechai, and about 3 miles west of the main N-S road from Tel Aviv to the Gaza Strip. 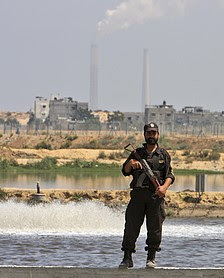 It is no more than a mile south of the huge coal-fired electric plant just south of Ashkelon which is often where qassams are aimed. Since qassams cannot be aimed accurately, many that are sent in the direction of the electric plant land short of their goal, in the area of Zikim. 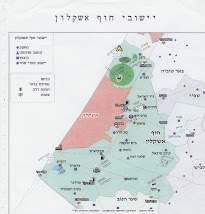 The kibbutz is also just a bit northeast of a nearby army base, so if anything is aimed toward the base and misses its mark, it may land closer to Zikim. A little over a mile west of Zikim is another kibbutz, Karmia, which also has had its share of qassams landing on it. As we drove from the main highway (#3) west toward Zikim, I noticed that the southern side of the road was lined with closely planted, tall cypress trees. The purpose historically was to prevent Gazans from seeing cars on the road. When we passed Kibbutz Karmia, we could easily see the many caravillot (nice temporary housing) where some people who left Gaza now live. Some plan to stay at the site and others hope to move to elsewhere. A few of those who had been there left months ago when Karmia was hit by a qassam and a child was wounded. Karmia has gone through privatization and, in theory, is not really a kibbutz any longer except in name. Talia and Yuval met us under the bus stop, which was surrounded by safe places to stand. Howard and I were very impressed with Zikim and very relaxed there. Talia, Yuval’s Mom, told us that so far a majority of the members of the kibbutz do not want to privatize. The kibbutz’s 80 family units and approximately 140 members get along quite well and want the current economic situation to continue. (Including children, 300 people reside here.) The only things that the members pay for are electricity, water, and meals in the dining room at a reduced price, and, of course, the private use of kibbutz cars. One thing we immediately noticed on the kibbutz was the security rooms, which were brought in and attached to each home. 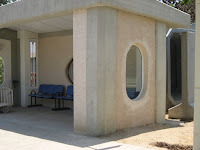 Also, the bus stop has a secure place to stand, and other protective barriers are sprinkled among the common areas of the kibbutz. Zikim and Karmia are two of a very small number of communities that have such protection. Even Yad Mordechai , which is a good mile closer to the Gaza border but not in the same line of fire, does not. 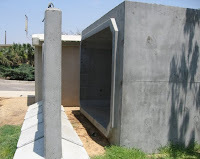 In mid-June, Hof Ashkelon was hit with dozens of qassam rockets from 3 to 4 p.m. after Hamas announced that Israel had bombed a home of one of its leaders in Gaza. Many of the rockets landed in the Zikkim area. Talia was in the dining room and could not leave, while Yuval was at home, quite frightened by the non-stop bombardment. It felt like it went on forever. I can sympathize. When I lived on the Golan in the early 70s, I remember a shelling that, as we sat in shelters, felt like it lasted for hours when it only was 20 minutes long. After the kibbutz members could go outside, they saw a number of small fires on one side of the kibbutz from the qassam rockets. The kibbutz does not have the equipment to put out such fires, so the local fire trucks finally arrive and put out the blaze. We took pictures of the burnt grass. Luckily the wind was not blowing strongly like the day we visited, or the damage would have been much greater. As it was it only affected a few dunam. Talia and Yuval gave us a tour of the kibbutz. The high point (no pun intended) was on a hill on the edge of the kibbutz, where we could see Gaza City clearly, the Mediterranean, the coal-powered electric power plant, etc. We really could get an impression of how close everyone is. Talia and Yuval told us the history of the kibbutz, which was founded in 1949, a year later than Yad Mordechai,, by Romanian Holocaust survivors. They first lived in an abandoned Arab building., which was used for many years until it became unsafe. We approached it form the back, and then saw the what remains of the elegant front. Members soon founded a mattress factory (with straw as stuffing) and worked in agriculture which became more important than industry in the 60s. In the 70s, the kibbutz re-started the mattress factory using modern materials (foam). Yuval’s father managed it for 5 years. Now they also have a factory that makes auto and truck parts and parts for medical instruments like CT scanners. Their dairy is the biggest money producer for them in agriculture. We did see some agricultural fields include one where thornless cactus fruit is grown. Although the kibbutz is not rushing toward privatization, there are areas of change. Originally the kibbutz members had small places to live and the children were in their own separate units. There were about 4 different waves when homes got bigger. Nown new residences in a new neighborhood are being built for the “vatikim,” those who have been members the longest. The kibbutz provides the ground floor, and if members want a second floor, they have to pay for it by themselves. Houses are definitely bigger. When the vatikim move to their new homes, hopefully the next generation will move back to the kibbutz to homes made available by the move. Right now every home is filled and others are waiting for vacancies to come. Even with the fear of qassams, it is considered a good place to live….and we could see why. Hello from Canada----Dave Payne here----volunteer at Kibbutz Zikim in 1973. Many fond memories of everyone there and working with the cows and in the fields.